Summer 2016. We’re on our way through the southern part of Sicilia, softly wistling Morricone’s great tune “Once Upon a Time in the West”. Gorgeous beaches, no, absolutely no shade. But a lot of sand and heat! We’ll be meeting Paolo Groppioni, who is vacationing in this aerea. 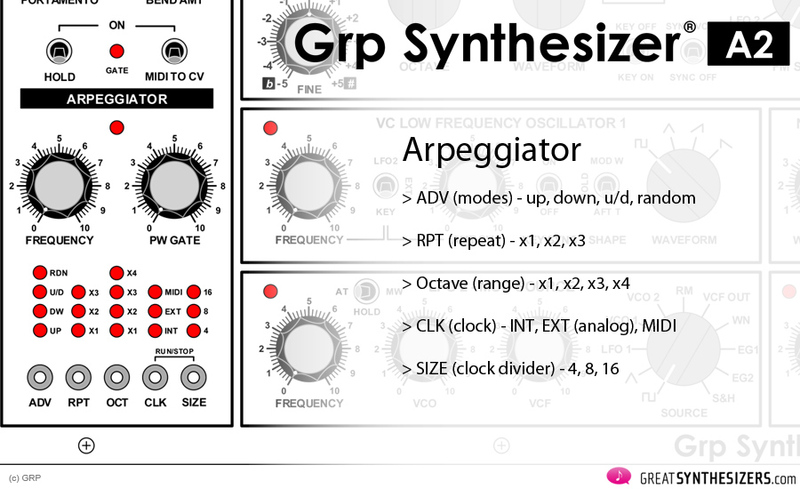 With him a good friend: the new GRP synth! The A2 is a true surprise. Not because it’s analog, and not because it can do this and that (it IS analog and it can do a lot), but because it exists in the first place. It’s as simple as that. Having the new GRP R24 sequencer in mind, we’re flabbergasted at the A2, suddendly lying there on the table. The perfect buddy for the sequencer. The same size, even the same housing. Gorgeous! The A2 is unmistakably a GRP. Great hand-crafting, tricky features, an analog sound that is velvet and lush. New additions are an arpeggiator, the supersaw of oscillator 2, a single multimode filter that is capable of stereo, and various new modulation routings which we haven’t seen up until now. 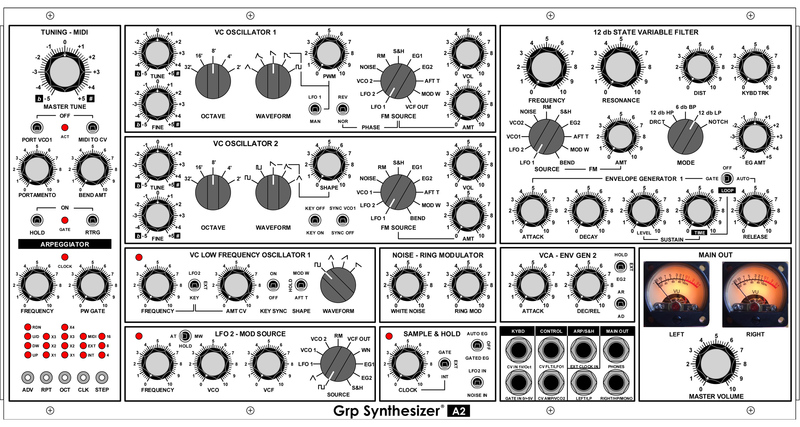 Concepted as a desktop- or racksynth (rack-ears instead of the wooden panels), the GRP A2 can also be mounted into large modular systems (5HE) à la Synthesizers.com, Moon Modular, etc. * For that FAT voice, for instance. In other words: for that extra sound. Visually, the GRP A2 has a striking appearance. Especially because of the illuminated VU-meters. And also because of the arpeggiator’s LED-chains. Unfortunately (but necessarily) there’s an external power supply – something the size of the A2 demands. And in addition, the power connection for a modular synth is an internal prewire, so that the A2 doesn’t need the external PSU when mounted in a modular cabinet. That’s why the external PSU is the one – and only – perfect solution. 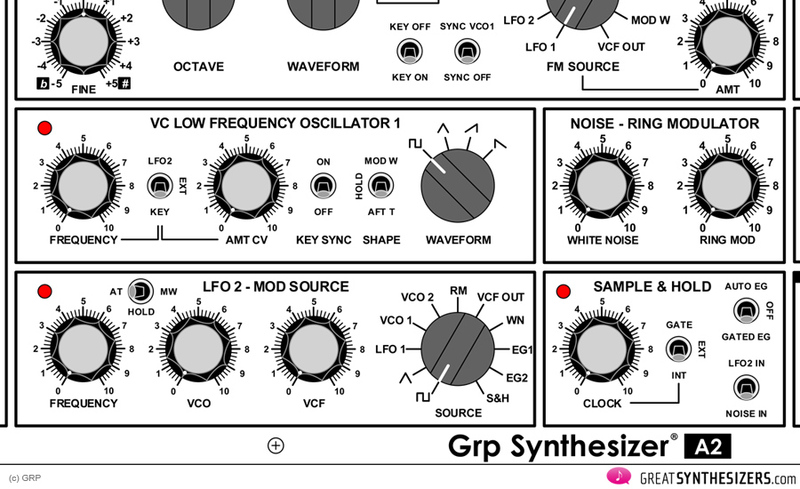 The GRP-principle remains unique: all those switchable modulation routings offer (almost) endless sound possibilities. 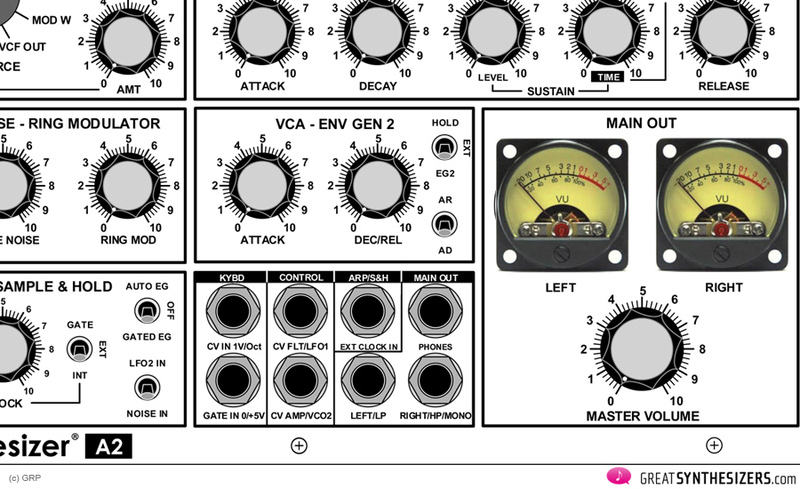 Have a look at the VCO graphic and imagine what sounds you’re able to create with those 11 FM SOURCES! VCO2 has a nice extra: supersaw (which reminds us a little of the Waldorf Rocket). Supersaw stacks up to 8 sawtooth waveforms. The more you turn SHAPE clockwise, the fatter the sound! That also goes for sawtooth-triangle and triangle (see graphic). The filter compartment is very powerful. Although it’s a single multimode-VCF (as opposed to the double filter of the A8 and A4), it is capable of true stereo! Switching to DIRECT mode, highpass appears at the right, lowpass at the left output. Modulating the VCF with one of the LFOs, this leads to stunning stereo-filtersweeps. (Now it’s time to listen to the attached soundfiles). Our personal highlight is the NOTCH filter. It sounds like a phaser! Gorgeous, so to speak. (Soundfile DEMO2 is a mixdown of 4 notchfilter-tracks). There are 2 LFOs. 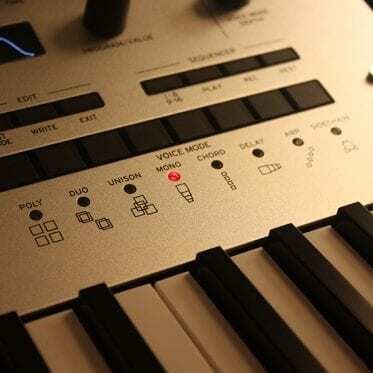 The first – VC Low Frequency Oscillator 1 – offers speed-control via KEY (the higher you play, the faster the LFO), EXT (analog CV-Signal attached to the A2) or LFO2. Envelope would have been another great modulation source, too, but well … it can be realized via EXT IN in any way. 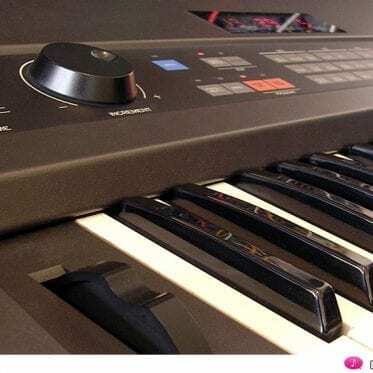 KEY SYNC is useful, resetting the LFO shape with every note you play. Modulation output of LFO1 can be at fixed level (HOLD) or can be controlled via AFT Touch or Mod Wheel. 2 envelopes: a full-scale ADSR and a cut-down AD/AR. The big one is for the filter and offers that great loop-feature first seen in the GRP A4 (ok, ok … also seen in the EMS AKS, EDP Wasp or OSCar many decades ago). The AD/AR is for the VCA. The CV-inputs are tricky. Some of them are stereo-inputs, so you have two inputs (ring and tip) simultaneously. CV FLT (VCF) and LFO1 (speed control) share one input. CV AMP (VCA) and VCO2 share another one. 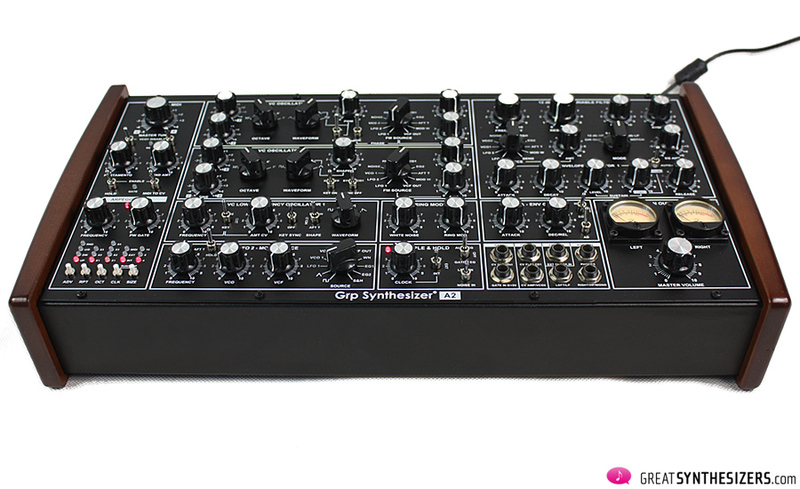 Excellent features and very useful when having some modular synths in your studio, or when attaching an analog step-sequencer (the GRP R24, or any other as well) to the A2. Ah yes, speaking of the arpeggiator … it has all the little niceties you’d expect, including some rare features like RPT (repeating each note x2 or x3) or the very useful PW Gate knob. SIZE acts as a clock divider, doubling the arpeggio speed from 4 to 8, te again from 8 to 16. Two silver switches allow de-activating VCO1 (portamento and pitch bend). These features, in particular, are very important. 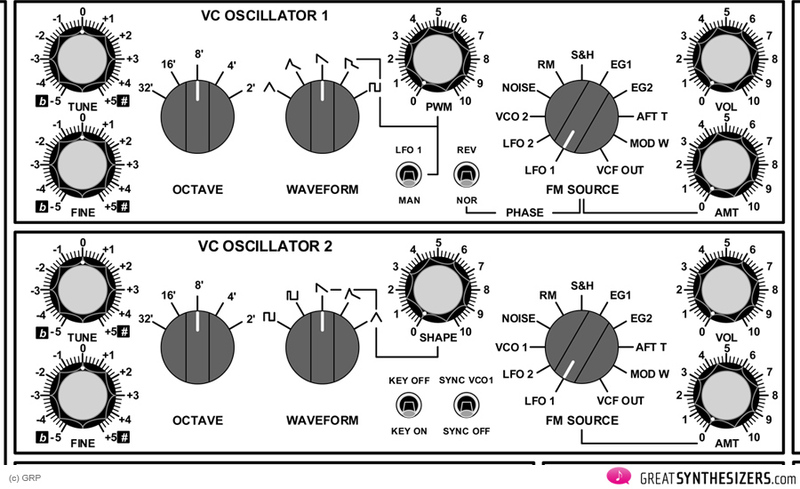 Imagine slow portamento affecting VCO2 only … drifting towards VCO1 until both oscillators meet up for that FAT sound. Imagine controlling the screaming part of VCO2 via pitchbender when both oscillators are in sync-mode. Imagine … imagine … there are plenty of examples! Then we have a HOLD switch (very useful at times). And a MIDI TO CV (off) switch, which simply allows to receive MIDI data, but disabling oscillator control. MIDI TO CV (off) makes sense in many ways … you might use the incoming GATE to clock the S/H, while S/H itself controls the oscillators … or you might run the VCOs via CV/Gate, but still want the arpeggiator to receive MIDI clock. In a nutshell, the sound of the A2 is noble, powerful and dense. Interesting, by the way, that the GRP instruments sound more and more aggressive the smaller they get. The huge A8 is generally soft and modest. The GRP A4 has a sneaky sound that nicks you when you’re not looking. And the A2 engulfs you with one bite! There’s absolutely no aspect of the analog sound spectrum which you would miss. Bass- and leadsounds have that cutting analog slash that’s not “every day” in the synthesizer world. We are especially surprised at the basses. Such depths as in the A2 we haven’t heard in a long time. (Listen to the attached bass-soundfiles). The range of the effect sounds is infinite. 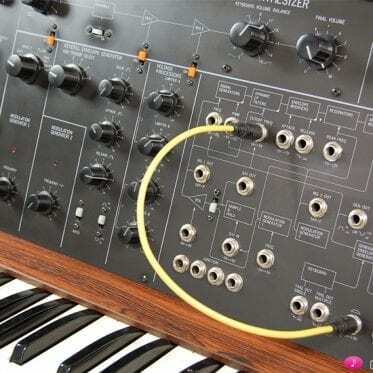 Not just because of the all-encompassing modulation routings, not just because of the characters displayed by noise, S/H and the beautiful ring-modulator, and not even because of the two LFOs and the extra loop-envelope. It’s the sum of all those things that give the GRP A2 its extensive sound complexity. At the same time – and that’s the most important of all – the basic sound of the GRP is both strong and magnanimous. All those little modulation routings and extras are nice, but none of them is worth a thing without a strong foundation. Listen to soundfile “DEMO1” – a simple sawtooth sound with lowpass filtering and sample&hold modulation. Nothing really special, but it’s gorgeous (especially the colorful filter resonance). What more do we need? For whom is the A2 designed? … small to medium-sized recording studios demanding the acoustically unusual. Few analog synths of this size have a similar sound potential. 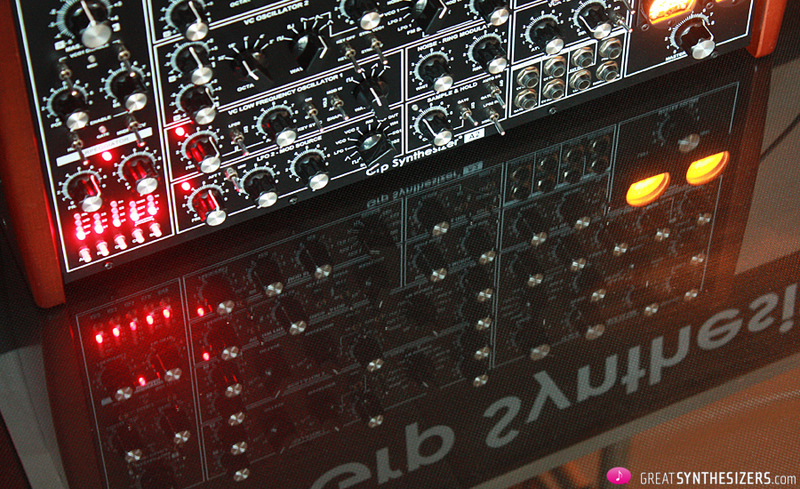 … larger studios with huge modular systems (5 units height, Moog size) demanding a complete analog voice. Take the A2 out of its housing, plug it in your modular system and away you go! That special GRP sound in your modular community. Out of its box, the A2 loses its MIDI ports, but there’ll be an optional MIDI/USB-interface (5 units height) for use in your modular system. … live performers with good stage presence. 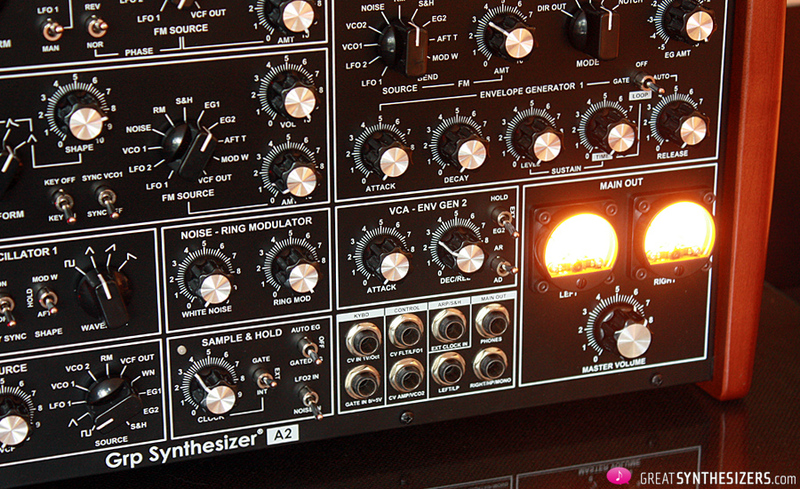 The A2 doesn’t take up much room, is easy to transport and is a complete analog synth. Small is beautiful! Even more beautiful: the GRP A2 and the GRP R24 (both in the same housing). That synth-sequencer-couple reminds us of the the great vintage duo RSF Kobol I plus RSF Sequencer. 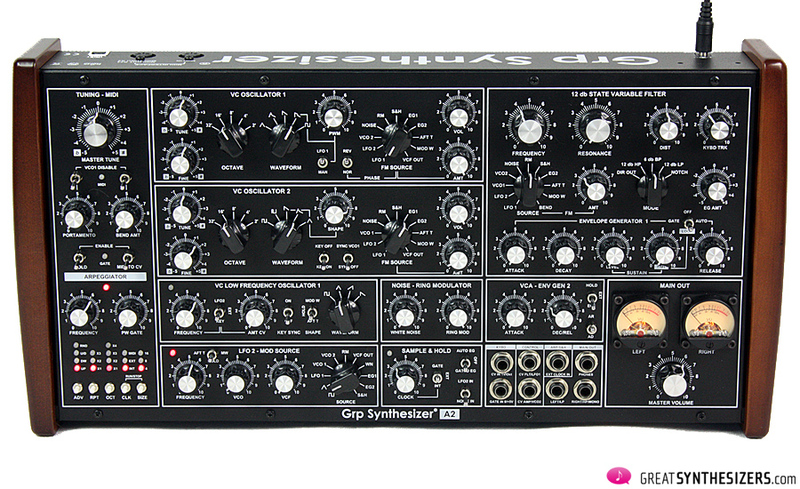 As with all GRP synthesizers, the A2 remains a high-quality instrument. Perfect hardware, versatility and flexibility, a sonorous sound. Great oscillators, great filter types, unbelievably modulation possibilities, ring-modulator, loop-envelope, VCF-overdrive … the creative musicians among you won’t miss a thing. AND – ! – the GRP A2 is made in Europe. Unusual, to say the least. Which guarantees good quality. That classical cherry on the cake. Wooden side panels and metal ears (for rack-mounting) included. Piuh … I personally love the Dominion 1 … all that weird modulation stuff, the little sequencer, the comprehensive CV-panel, the attached keyboard … “all-in-one” … and all at a very friendly price. It’s quite unbeatable! The Oberheim Two Voice Pro has a unique stereo sound-architecture, but it is way too (!) expensive … and (soundwise), it is somehow more limited (yes, it has that great SEM sound, but that’s it … no powerful LFO, no ring-modulator, a slightly tyring sequencer) …. Sorry I was more comparing the desktop SEM pro rather than the overpriced 2 voice. or even better to come the eurorack module with more sounds/modulations. How would you compare the raw VCOs sounds/ VCF/ VCA of those 3 brands/ models. The SEM / Two Voice Pro has a bombastic analog sound. Unique feature: continuously variable multi mode filter. (Sadly “not” controllable via CV.) 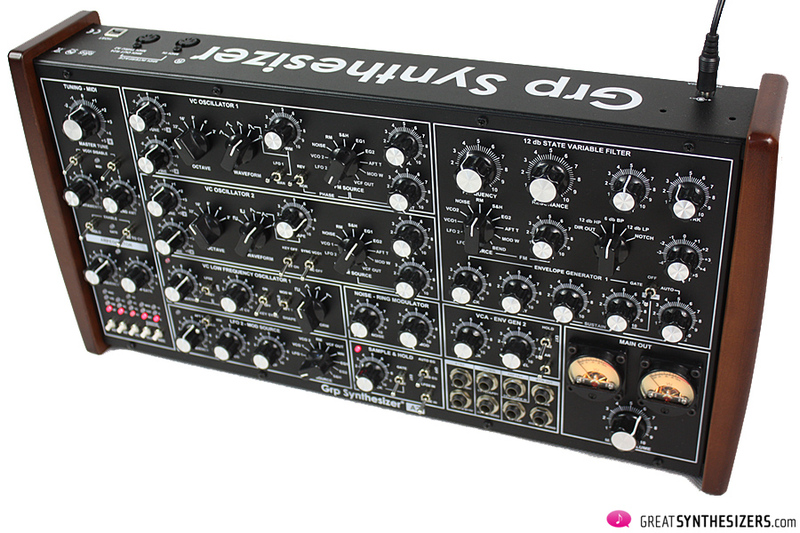 It’s a perfect synth for leads, basses and (filter) sequencing. Wonderful notch filter. Not very strong at FX-sounds, though. The MFB Dominion 1 has a very vigorous sound, too. Maybe it’s a little more clean and (slighly!) less rough. Unique features: multimode VCF with 15 filter types. 3 VCOs (!). MIDI “and” that very comprehensive CV-panel. Tons of modulation routings. 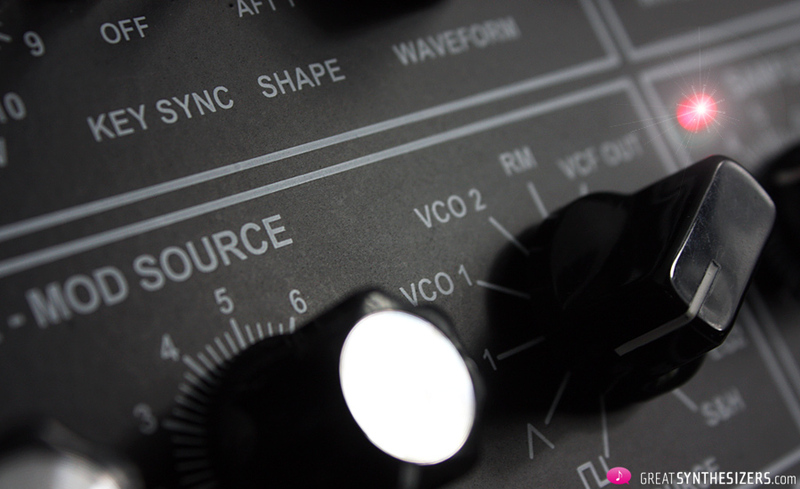 It’s a brilliant synth for the knob tweaker and sound designer (especially in combination with Eurorack modules). A near-to-perfect FX-machine. 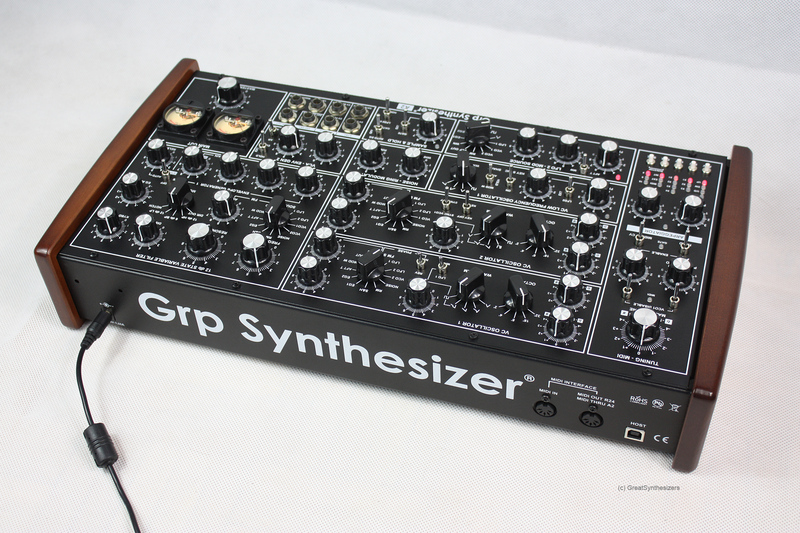 The GRP A2 is in between the Oberheim and the MFB. It has an extraordinary bombastic sound (don’t know why, but the bass is extremely low) and it has a vast array of modulation sources/destinations. The CV-panel is quite limited, though, but with its complex (internal) pre-wiring, it is almost as versatile as the MFB. So … I’d say the SEM/Two Voice Pro is for the leadsound synthesist and live-keyboarder (massive leads, strong basses, …), the MFB is for the free-style inventor / experimental musician, and the GRP A2 is for the one who needs the best (well, at least a high share) of both worlds. 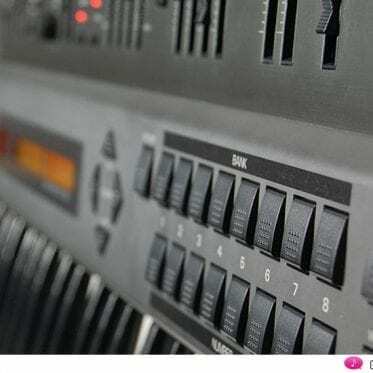 All synths – the Oberheim, MFB and the GRP – are well-designed analog synths. Whichever you choose, you shouldn’t be disappointed. A tough choice, of course – but defining your personal musical direction / musical needs perhaps allows to make an informed decision. What are the two tracks called ‘GRP A2 – A4 A8’? … these are demos with all 3 GRP synths. 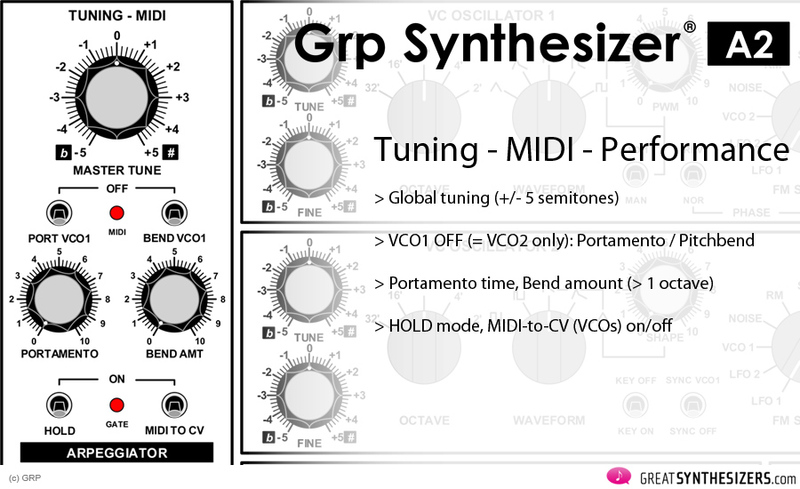 GRP A2 – A4 A8 (1): starting with A4 and A8 (stereo panning), soon supplemented by the A2 (bass lead sound – notch filter). GRP A2 – A4 A8 (2): GRP A2 (effect/ring mod pattern) and A4 (pulse stereo sequence) start. 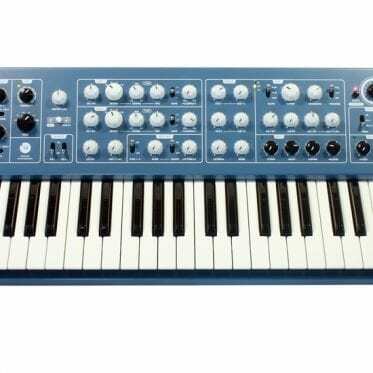 Main lead synth (the soft brass) is the A8. Do i need this little A2? 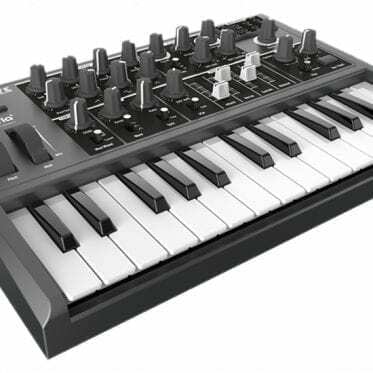 I think the A2 is the ideal synth for those who’d like to own a GRP (because of the overall synth philosophy / flexibility / sound potential), but who can’t afford the much bigger A4. In fact, I really need a polyphonic synth (my only one is the DX7 and it’s really too boring to program, but it’s my first synth, it’s a long long love-hate story :-) ). 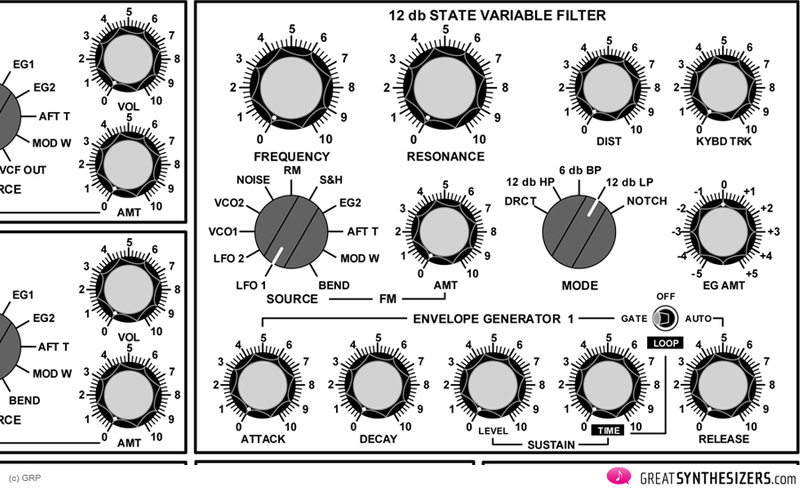 I can’t sell the Kobol (moslab reissue, not original) because it sounds right like I love it. So beautiful. But I am selling some other gear and I probably order an A2 because it made me feel the same impressive way. You’re right, the Dominion 1 covers all needs and purposes. 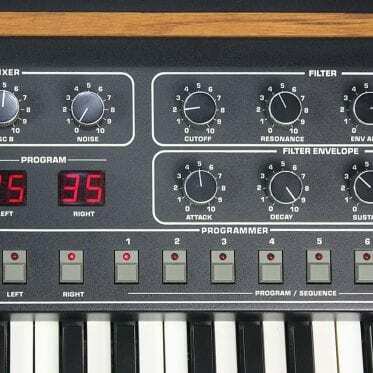 What a wonderfull synth! Thanks for your reviews and for your various, long and inspirated sound files. Perhaps this thread has already answered my question but given the Perfourmer Mk2, the A2, and the Dominion, which if them goes or can go) the furthest in terms of exploring sound, nuance, and surprise? I get it all that as analogue synths they’re all GREAT, each in in their own way. And I guess for integration with Eurorack, the calculation goes way over to the Dominion? … hi Mark … I guess “Yes” – the Dominion-1. – PERfourMER MKII: purest classic analog sound (oldschool); unique 4-voice rotating system (monophonic) or 4-voice polyphony; individual voice panning (! 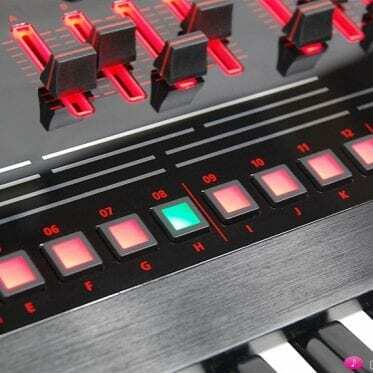 ); acceptable MIDI-features; very basic CV/Gate (optional) – big jacks. 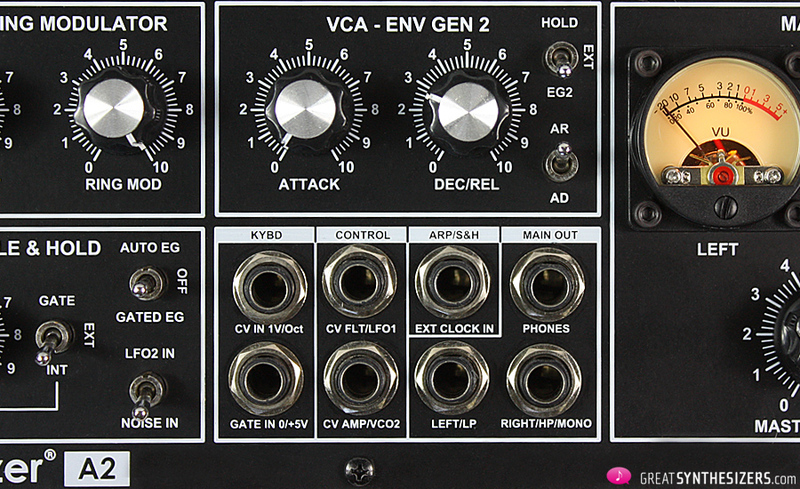 – A2: very powerful sounds; remarkable analog warmth and sonic flexibility; unique (GRP) modulation routings (11-way switches); multimode-VCF (stereo); acceptable MIDI-features; slightly enhanced CV/Gate panel – big jacks. – Dominion 1: strong sounds (3 VCOs) – slightly more “modern analog” than oldschool; enormous modulation-possibilities, surely the most flexible of all 3 synths; 12-types-multimode-VCF; acceptable MIDI; most advanced and definitely stunning CV-panel – small jacks. Thanks for info Theo! Now I am on ropes about smaller weight and size of A2 (travel is an issue) but have a FR 512 on the way and it’s probably better suited for CV connecting 2 Dominion. Well, lucky to have these choices! Lastly, it doesn’t sound like envelopes on Dominion are a game killer, just not as snappy as one might wish? But with inputs CV. That doesn’t make a difference? Your reviews are written with such care … thank you!! … well, the Future Retro 512 keyboard makes the Dominion 1 maybe a little redundant … do you need 2 keyboards? If I was you, I’d combine FR512 and GRP A2. You’ll be more than happy with the (deeply!) analog GRP sound (snappy envelopes, magic multimode filter, all those routing options) … all you need is a MIDI cable and – concerning CV/Gate – a few cables with one small (FR) and one large end (GRP). Thanks for those added thoughts Theo! A2 arrived, Future-Retro 512 arrived. Neither the A2 nor the 512 would speak MIDI to each other until I put a thru box in-between them. They sound utterly FANTASTIC together! Who knows, maybe an R24 lurks in the future! … MIDI thru box? Interesting. Great you like the sound! 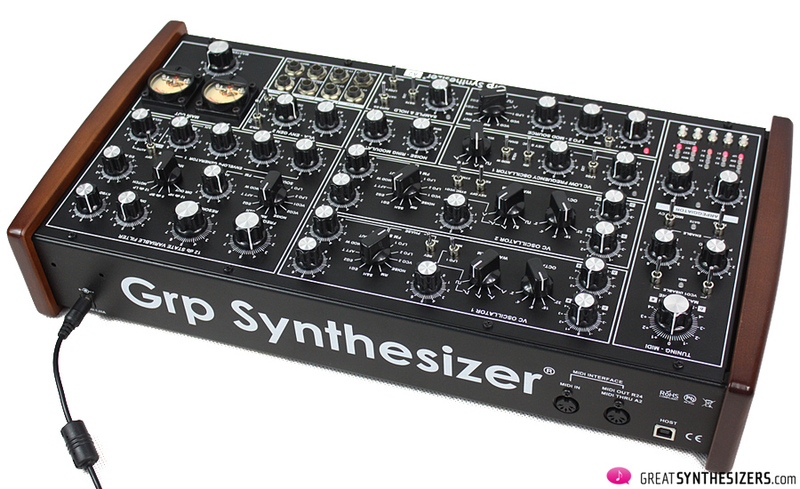 Hi there, I’m on the lookout for a new monosynth in this price range and at the moment my favourite one are the GPR A2 and the Macbeth Micromac D. I must admit the Micromac is just edging it with that 3rd oscillator but the 12db filter on the GPR sounds great. I wonder if you have any experiences with the Micromac? … I have no experience with the MicroMac, sorry. 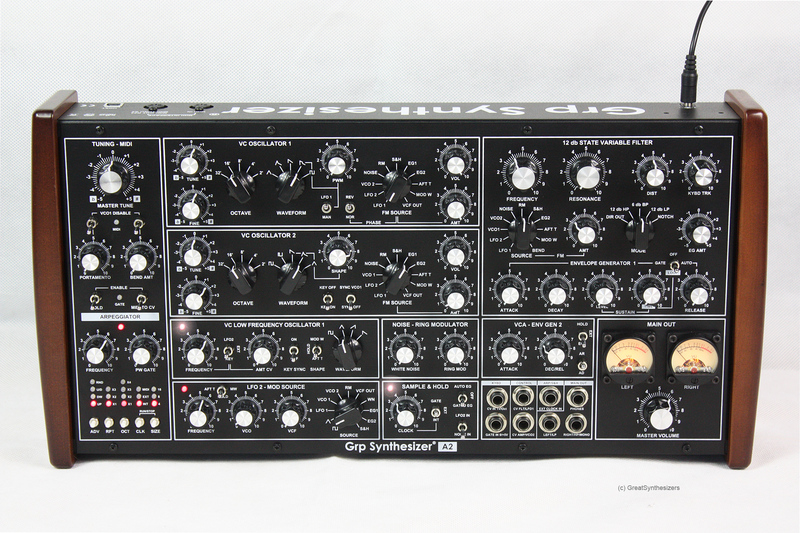 But all MacBeth synthesizers are great sounding instruments … so I’m quite sure it’s at eyelevel to the GRP A2. These are my two mono’s as I have both! They’re completely different. A2 can get a more weird. Micromac sounds more Moogy in general (of course), but still unique. In the end I think they’re too different to compare really, and they compliment each other quite well. If I could choose only one however, I would probably choose the Micromac. 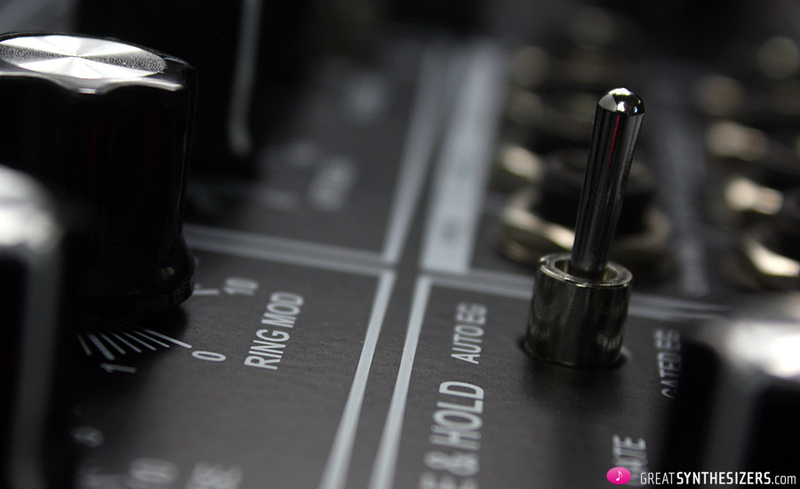 MacBeth synthesizers are brilliant … ! Is PWM expensive to implement or something? I’m seeing a trend in synths of either only one oscillator having it, or none at all. The GRP A2, Korg Monologue, and even the new Moog Grandmother only have PWM for one oscillator. I’m sure there are others. And then there are synths that don’t have it at all, like the Moog Minitaur and Model D.
… hi Jeff … You’re right. The A2 only offers PWM on VCO1. Anyway, there are synths that offer multiple PWM. GRP A4 – PWM on all 4 oscillators (with 2 LFOs to choose as mod source), Vermona Perfourmer MKII – PWM on all 4 oscillators (with 4 independent LFOs in total). Vermona Mono Lancet: 2 VCOs with PWM on each VCO – but only with optional (cv) break out box, the so-called “Modular Dock”. Great review Theo. I recently picked one of these up and am blown away by the sound. Incredibly detailed and hi-fi, with wonderfully snappy envelopes. The modulation routings are also great and novel. Thinking about the comparisons to the TO Two-voice and Dominion 1 above–for pure sonic exploration and sound quality, the A2 has to be the top choice. For live playing or other modular integration aspects, the other two would be preferable. 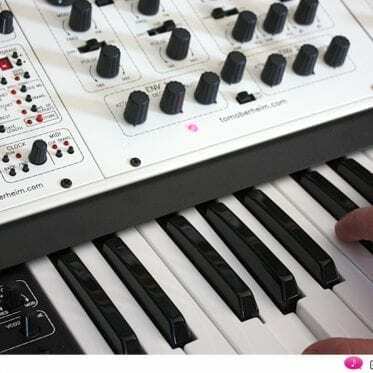 And of course the Oberheim has “that” classic sound. Regarding your comment about LFO 1 and using Envelope 1 to control speed, you CAN do this if you switch the speed control source to LFO2. Then whatever source LFO2 is using becomes the same for LFO1. Among these various routings, what is really missing is the ability to modulate the LFO/modulation “amount”, which would allow interesting shaped FM type sounds, but this is a minor omission overall. I love ‘Demo 1’; for me, the pad is just the right balance with the A2. 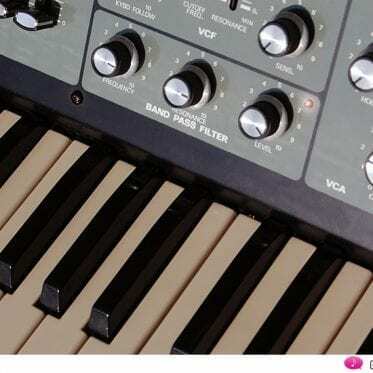 Next PostThe new Minimoog D – even better than the original?